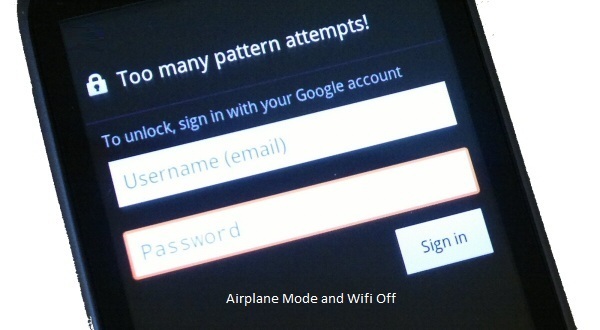 My Android tablet is locked because too many wrong pattern attempts. When entering a wrong pattern 20 times (you may be not stupid to enter it wrong 20 times, but your child or someone else who wants to lock your device what happen ? ) your devices is locked and asking to unlock it via your google username and password. You are lucky if the device locked with Wifi on or mobile data network on. Then you can simply log into the google account and unlock it. But I’m not that much lucky and my tablet was in “Airplane mode on” with “Wifi off”. Here what I have done is clear lock patterns and remove the permanent lock from the database. Yes here I have break the security, but saved my device as can be used again. If you are concern about the security of your device “Always keep off USB debugging mode“. But I don’t know what will happen to your important data when someone locked your device. If you know about a better solution, add it as a comment here. It will help others too.